Georgia Purdom is a creation scientist with a specialty in molecular genetics. She is currently working for Answers in Genesis as a teacher, researcher, writer, and lecturer on the book of Genesis. Purdom is one of few women in her field engaged in full-time research and lecturing. 3 Georgia Purdom: Does the Bible Have a Place in the Marketplace of Ideas? Georgia Purdom has been a Christian since the age of eight, when she accepted Christ at a youth camp . After hearing Ken Ham speak as a student at Cedarville University (Ohio), Purdom became interested in creation studies. While working towards her Ph.D., Purdom's belief in the Bible was challenged by a professor who told her, "...creationists don't know how to think critically." This remark motivated her to research the evidence available for different viewpoints on the origins of life. While attending a BSG (A Creation Biology Study Group) Conference in 2001, she learned about the Hebrew word yom (meaning a 24-hour day), which is used repeatedly during the creation account in Genesis 1, and became convinced that the Biblical story of creation is true . 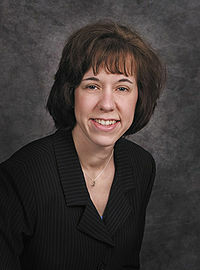 Purdom graduated in 2000 from Ohio State University after earning her Ph.D. in molecular genetics . Soon afterward, she became a biology professor at Mount Vernon Nazarene University in Ohio, where she was employed for six years . Today, she works for Answers in Genesis as their first female full-time researcher and speaker who holds to the literal translation of the Bible (including the book of Genesis) and the belief in a young earth . At Answers in Genesis, Purdom is involved in lecturing, writing articles for the website and Answers magazine, and teaching online classes. 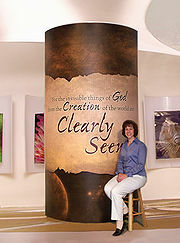 She also designed the "Natural Selection Is Not Evolution" exhibit for AiG's Creation Museum in Kentucky . Georgia Purdom and her husband Chris live in Indiana. They adopted their daughter, Elizabeth, from China in 2005 . Purdom has written papers published in the Journal of Neuroscience, the Journal of Bone and Mineral Research, the Journal of Leukocyte Biology, the 2008 Proceedings of the International Conference on Creationism, and the Answers Research Journal. She is a peer reviewer for Creation Research Science Quarterly and Answers Research Journal. She also has memberships in several scientific organizations including the Creation Research Society, the American Society for Microbiology, and the American Society for Cell Biology. Georgia Purdom in front of a display at the AiG Creation Museum in Kentucky. For her graduate work, Purdom studied the genetic regulation of factors important for bone remodeling. Since then, her specialty has been cell and molecular biology. Other interests include the problems with naming natural selection as the cause of evolution, as well as the Intelligent Design movement. Purdom has written several articles about natural selection and Intelligent Design (ID) which can be found on the Answers in Genesis website. Concerning natural selection, Purdom's argument is that, while it does occur and causes changes in organisms, natural selection always results in a loss of information, not the addition of new information. On the subject of Intelligent Design, Purdom believes that the movement has many good points, but she has a problem with the fact, while it insists there must be a designer, it does not identify the designer. In an article on the subject, Purdom says, "...the major problem with the ID movement is a divorce of the Creator from creation. The Creator and His creation cannot be separated; they reflect on each other. In today's culture, many are attracted to the ID movement because they can decide for themselves who the creator is—a Great Spirit, Brahman, Allah, God, etc." . One of Purdom's pursuits while at AiG has been research and models on the role of microbes before and after the Fall of man (described in Genesis chapter 3). Regarding this topic, Purdom organized and headed the first meeting of creation microbiologists, which was called Microbe Forum, in 2007 . The forum's purpose was to present research on the role of microbes in the world, as well as to counter evolutionist views on the subject. Those in attendance included co-leader Dr. Joseph Francis (bacteriology and immunology), Dr. Kevin Anderson (bacteriology), Dr. Dan Criswell (bacteriology), Mr. Frank Sherwin (parasitology), Dr. Yingguang Liu (virology), and Dr. Alan Gillen (bacteriology), as well as two Ph.D.-holding scientists from secular universities with specialties in mycology and virology. Microbe Forum 2 was held in 2009 with more research on the topic presented by eight creation microbiologists . In addition, Purdom presented her research on microbes at the 2008 International Conference on Creationism. She is also a member of the GENE project in progress at the Institute for Creation Research . Georgia Purdom: Does the Bible Have a Place in the Marketplace of Ideas? The generation of neuronal heterogeneity in a rat sensory ganglion. Hall, A.K., Ai, X., Hickman, Georgia E., MacPhedran, S.E., Nduaguba, C.O., and Robertson, C.P. 1997. The Journal of Neuroscience 17:2775-84. The Microphthalmia Transcription Factor Regulates Expression of the Tartrate-Resistant Acid Phosphatase Gene During Terminal Differentiation of Osteoclasts by A. Luchin, G. Purdom, et al. Journal of Bone and Mineral Research Volume 15. 11/3/2000. American Society for Bone and Mineral Research. The microphthalmia transcription factor and the related helix-loop-helix zipper factors TFE-3 and TFE-C collaborate to activate the tartrate-resistant acid phosphatase promoter by K.C. Mansky, G. Purdom, et al. Journal of Leukocyte Biology. 2002. Society for Leukocyte Biology. The microphthalmia transcription factor (MITF) contains two N-terminal domains required for transactivation of osteoclast target promoters and rescue of mi mutant osteoclasts by K.C. Mansky, G. Purdom, et al. Journal of Leukocyte Biology. 2002. Society for Leukocyte Biology. More Abundant than Stars: An Introductory Overview of Creation Microbiology by J.W. Francis and G. Purdom. Answers Research Journal 2 (2009): 85-95. War of the World Views: Powerful Answers for an "Evolutioniszed Culture"- "Is the Intelligent Design Movement Christian?" Ken Ham, Georgia Purdom, et al. Answers in Genesis 2005. Morality and the Irrationality of an Evolutionary Worldview by Georgia Purdom and Jason Lisle. Phi Kappa Phi Forum, Spring 2009: 6. The Code of Life - speaker Georgia Purdom. DVD. 2007, Answers in Genesis- U.S.
Dissecting Darwin Audio CD with speakers including Georgia Purdom. 2009, Answers in Genesis- U.S. The Intelligent Design Movement: How Intelligent Is It? by Georgia Purdom. DVD. 2005, Answers In Genesis- U.S. The New Answers Book 1: Is Natural Selection the Same Thing as Evolution? (chapter 22) and The New Answers Book 2 by 15 authors including Georgia Purdom. Answers in Genesis- U.S.
For a list of recent articles by Georgia Purdom, visit Answers in Genesis- Get Answers. Dr Georgia Purdom Ph.D.: Molecular Geneticist by Answers in Genesis, USA. Creation Ministries International. accessed 10/4/09. Dr. Georgia Purdom. AnswersinGenesis.com. © Copyright 2009 Answers in Genesis. accessed 10/4/09. Dr. Georgia Purdom: Researcher, Author and Speaker. accessed 10/9/09. The Intelligent Design Movement: How Intelligent Is It? by Georgia Purdom. 5/2/06. copyright 2009 Answers in Genesis. accessed 10/10/09. Microbe Forum 2 Comes to AiG by Dr. Georgia Purdom. 8/25/09. Answers in Genesis- U.S. accessed 10/11/09. Microbe Forum at AiG—the first ever meeting of creation microbiologists by Georgia Purdom. 8/14/07. copyright 2009 Answers in Genesis. "God Said It, That Settles It" by Ronald Bailey. 7/21/05. ReasonOnline ©2009 Reason Magazine. accessed 10/4/09. Researchers Create Largest DNA Structure -- But is it Life? y Jennifer LeClaire. 1/25/08. Sci-TechToday.com © 2000-2009 NewsFactor Network. accessed 10/4/09. Dr. Georgia Purdom. © 2009 Zoom Information Inc. accessed 10/4/09. Who Designed That? : Creationism v. Intelligent Design by Tom McIver. 6/6/07. Sceptic- eskeptic. accessed 10/4/09. Young Earth Creationists of the World Unite! by Jason Rosenhouse. 10/28/05. Sceptic- eskeptic. accessed 10/4/09. Get Answers. 2009. AnswersinGenesis.com. accessed 10/4/09. Media: Video Interview between Michael Shermer and Georgia Purdom. This page was last modified on 29 October 2015, at 19:44.